Electric City York Ltd are Commercial Electricians covering Yorkshire and Humberside, providing a comprehensive range of electrical services for commercial and industrial clients. Electrical inefficiency costs money which businesses can ill afford to lose. Many commercial organisations have outdated electrical systems which are reducing their potential efficiency and smooth running. We are a family run firm of electricians in York that offers a comprehensive installation and replacement service including the installation, replacement and upgrading of fuse boards as well as emergency lighting and system maintenance. We install and maintain systems for the protection of your business premises including fire extinguishers, access control systems, fire alarms, emergency and security lighting. We are experts in electrical compliance. We carry out electrical testing including PAT testing and fixed wire testing, and provide condition reports (EICRs) where relevant to help you keep your business compliant. If your requirements or project isn’t listed here, don’t worry! We undertake all commercial electrical services. If you are looking for a York electrician or need a commercial electrician anywhere in the Yorkshire and Humberside area please get in touch. We would be happy to discuss your specific requirements. We offer free site visits to discuss your project as well as a free no obligation quotation with our recommendations. 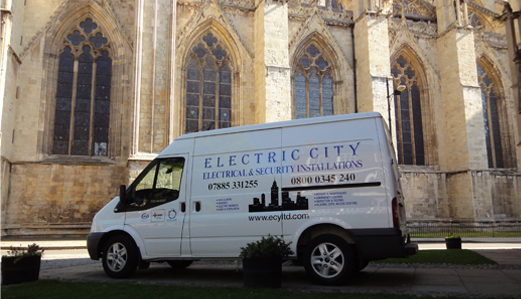 I own a number of rental properties in York and have used Electric City York for the last 9 years for various tasks ranging from PAT testing, fitting new lights, periodical testing and upgrading of the electrics. I also used Electric City to upgrade the wiring of the property I live in as part of a renovation project. The service I have received has always been prompt, reliable and of a high standard.